I've just got back from a week cycling from Barmouth to Yarmouth. I've done two End to Ends - Land's End to John o'Groats, and Cape Wrath to Dover - so this time I did a Side to Side. My route - about 350 miles, across the middle of Wales and England - took in mountains and fens, countless pleasant villages and towns, and rather a lot of Wetherspoons. 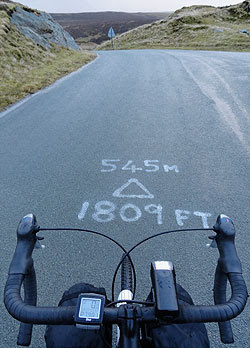 For instance, Bwlch y Groes (top right) is Wales's highest road, at 545m. The name comes from the noise you make at the top. Out east, things are more two-dimensional. 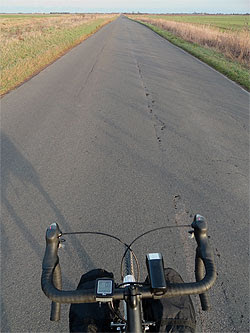 This (right) is near Spalding. 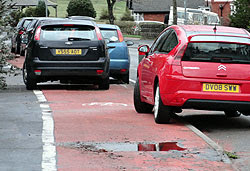 In between are many showcase cycle facilities, such as this wide, well-paved cycle track (right) offering a safe alternative to the busy road east out of Stafford town centre. There are more details on my Barmouth to Yarmouth, Poole to Goole blog, but this is a quick recommendation for Tranche Touring. The 'tranche' is the block-release, at certain times through the year, of cheap hotel rooms (£12 for one or two people!) from chains such as Travelodge or Premier Inn. You can find details of when the tranches are released from sites such as Money Saving Expert.com. Book in advance when the tranches are released and you can set up a bike tour very cheaply, and with the pleasant prospect of a bath and comfy private room after you've been rained on for six hours. On the B-Y trip, my five hotel stays all came at £12 or £15 each - cheaper than a dorm bed in a hostel. 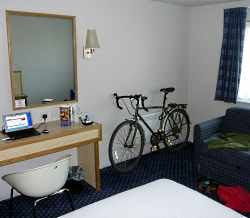 Travelodge also seem perfectly happy for you to take your bike into the room with you (above right). My tourer has more loyalty points than me. I've never had a problem taking my bike into a hotel room, but that might be because I ride a folding bike. I don't mind camping when I'm touring, but I have to agree, it is nice to have a hot shower after it's been raining.